"Come now and let us make a wife for Llew." In the wide poppy blowing for her mouth. And bore away his wife of birds and flowers. Lugh,Lugus,Llew,Lugh Lamfada,Lugh Samildanach. These are all names that we may know the God Lugh by. He is a god of many talents. I have been stuck by the comparisons to the Ideas behind the stories of lugh and the "way of the Warrior" outlined by Miyamoto Musashi in the Book of Five Rings (Goirin No Sho).
" These rules seem to be the same Ideal that Lugh lives by and sought out by those who see him as a Hero or Leader. He was the Leader of the Tuatha De Dannan for this very reason. In the Following Links and Quotes I am attempting to help you learn more about lugh,and hope you get a better understanding of him from this page. Lugus:The Many Gifted God:An Essay by Alexi Kondratiev or Imbas.This is an excellent and weighty essay. I reccomend it heartily for anyone interested in the story and history of Lugh. I put this first for a reason. Ar an Diorseoir ris an deagh Laoch (the doorkeeper said to the noble warrior): Part of an ancient poem with Lugh in the text. Math of Mathonwy: The Famous tale for the Mabinogeon that includes the Story of Llew. LUGH(Welsh equivalent Lleu) belongs to the Mythological Cycle and the Ulster Cycle,He is related by blood both to the Tuatha De Danann and to their enimies the Formorians(He is the grandson of BALOR). 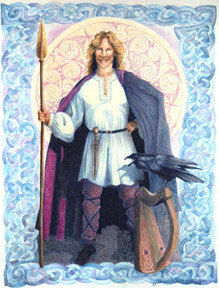 Lughs name means 'Shining One', and he may well have been a god of the sun or of light. The Summer festival of LUGHNASAD on 1 August is associated with him: tradition has it that Lughnasad was established by Lugh in memory of his foster-mother. The world 'lugos' means 'RAVEN', and there is a tenuous link between Lugh and ravens; before the Second Battle of Magh Tuiredh, Lugh is warned by ravens of the coming of the Formorians. Towns such as Luguvalium(Carlisle) and Lugdunum(Lyon) are linked by scholors to Lugh and at Ludnumum,coins depicted images of ravens. In the Irish traditions Lugh is portrayed as a shining god of light, but also as a warrior,sorcerer and master of crafts." From "The Second Battle of Mag Tured(Moytura) Now as to the Tuatha De, this is what they were doing. After Bres, Nuada was again in sovereignty over the Tuatha De. At that time he held a mighty feast at Tara for them. Now there was a certain warrior on his way to Tara, whose name was Lug Samildanach. And there were then two doorkeepers at Tara, namely Gamal son of Figal and Camaall son of Riagall. When one of these was on duty he saw a strange company coming towards him. A young warrior fair and shapely, with a king's trappings, was in the forefront of that band. They told the doorkeeper to announce their arrival at Tara. The doorkeeper asked:"Who is there?" "Here there is lug Lamfada (i.e. Lugh Long-Arm) son of Cian son of Diancecht and of Ethne daughter of Balor. Fosterson, he, of Tailltiu daughter of Magmor king of Spain and of Eochaid the Rough son of Duach." The doorkeeper asked of Lug Samildanach: "What art dost thou practice?" Said he; " for no one without an art enters Tara." The doorkeeper answered:"We need thee not. We have a wright already, even Luchta son of Luachaid." He said: " Question me, O doorkeeper! I am a smith." The doorkeeper answered him:"We have a smith already, Colum Cualleineach of the three new processes." He said again:"Question me: I am a harper." Said he:"Question me I am a hero." The doorkeeper answered:" We need thee not. We have a hero already, even Bresal Etarlam son of Eochaid Baethlam." Then he said:" Question me, O doorkeeper! I am a poet and I am a historian." He said," Question me: I am a sorcerer." "We need thee not. We have sorcerers already. Many are our wizards and our folk of might." He said:" Question me; I am a leech." "Question me,"said he; I am a cupbearer." then that was related to Nuada. "Let him into the enclosure," says he; " for never before has man like him entered this fortress." Then the doorkeeper let Lug pass him, and he entered the fortress and sat down in the sage's seat, for he was a sage in every art. Then the great flag-stone, to move which required the effort of four-score yoke of oxen, Ogma hurled through the house, so that it lay on the outside of Tara. This was a challenge to Lug. But Lug cast it back, so that it lay in the center of the palace and made it whole. "Let a harp be played for us,"said the company. So the warrior played a sleep-strain for the hosts and for the king the first night. He cast them into sleep from that hour to the same time on the following day. He played a wail-strain, so that they were crying and lamenting. He played a laugh-strain, so that they were in merriment and joyance.